Thank you so much for your post. My friends and I were looking into going to Fuji Rock but were held back as there is a lack of information about the festival on the homepage. Your post helped a lot! One question - we are slightly concern about camping, have you camped there before? Would you recommend it? I understand a lot of the hotels are already fully booked but do you have any suggestions (perhaps hotels that are a bit further away...)? Thank you so much! Looking forward to your reply. I've camped there a few times and will again this year. If you don't mind roughing it a bit, I would recommend it. I recommend a good waterproof tent (it usually rains) with an annex you can escape to in the mornings when the sun turns the tent into a sauna. Also note you will have to wait in line a bit to use the toilets, outdoor sinks and communal showers. Everybody is friendly and helpful so camping is fun. The location of the camp site also can't be beat - right outside the festival. I'd say all the nearby hotels would be booked out by now! 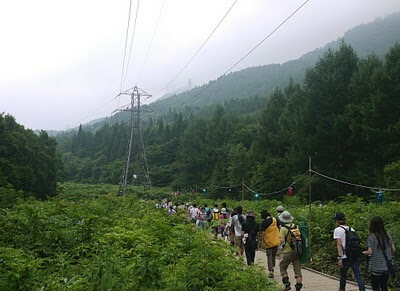 But you could try your luck in the Echigo Yuzawa station area, or around Tashiro, Mitsumata or Asagai if you don't mind getting a bus there and back every day. I'd say they are mostly sold out too or have greatly inflated prices. 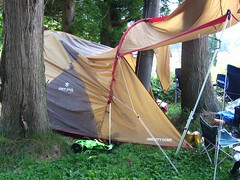 If you are well-prepared (follow the advice on my blog) you will enjoy camping! Thanks for your prompt reply and advice! Also, do you recommend buying package deals from third party sites (eg. http://www.tokyotravelpal.com/tour-Fuji-Rock-Festival-Package-Tickets.htm) or festival tickets from the site and train ticket separately? Would it be okay to buy train tickets at the Tokyo station upon arrival? I don't know about the package deals, sorry. But it's easy enough (and cheaper) to just buy the festival tickets and train tickets once you get to Japan. My friends dropped out so have a spare 3 day weekend ticket if anyone's interested! We've just booked flights to be in Tokyo for the Sat/Sun of the festival... question is, how practical would it be to just do one day at the festival? 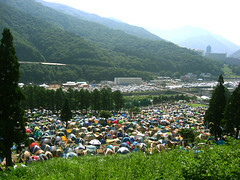 Could we do it in a day trip from Tokyo, or should we find accommodation nearer the festival site. We've got 2 weeks in total in Japan, can you recommend any other must see music related sites? Thanks, Aidan. Thanks for your prompt reply and advice! I've camped there a few times and will again this year.I have a question: how practical would it be to just do one day at the festival? Thank you!